Labeled as “the ideal community.” Stop by and it is easy to see why. Everything you need, minimal commuting. Bartram Park's multiple residential communities will include a perfect fit for you. From single family homes to townhouses, Bartram Park has it all! Contact your realtor to learn more & schedule a showing. 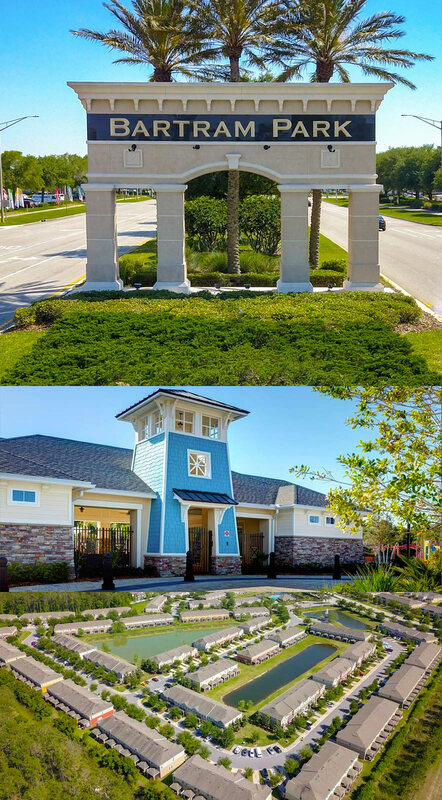 Bartram Village is a commercial park located on the outskirts of the residential communities. Businesses include gas stations, banks, restaurants, hotels and more. Bartram Park includes a 4 mile long, 12 foot wide sidewalk for enjoying the outdoors. The Julington-Durbin Preserve located within Bartram Park is over 2,000 acres and provides great recreational activities.